There it sits. After years of work and literally blood sweat and tears, (including gallons of fluid post-surgeries) I have a draft. A couple months ago, I was connected to a smart and capable editor through an old friend, and knew immediately she was the perfect one. There was no long Google search for fabulous non-fiction editors and asking other writers for a referral. My experienced editor magically came into my life. I was 3/4 of the way through my second pass when we made the decision to work together. Truly motivated, I worked day and night to finish. I felt this great sense of relief to hand it over for a fresh pair of eyes to hopefully ground me in some brilliant way. I was both terrified and excited to see what would come back. Six weeks later, I received my manuscript with smart and daunting notes to create a polished draft. My editor, enthusiastic about my writing and the potential of my book creating a new form of creative non-fiction, decided it was her calling to shepherd me through to a finished draft. Needless to say, I was deeply grateful. There is nothing simple about the next step though... more like 10 steps to accomplish this re-write fete. I printed out the 200 plus pages. It's the first time I've seen my book in hard copy. I was struck by its weighty content. For several days, it sat on the table taunting me. I simply stared at it. So many thoughts ran through my head: I can't do this. The editor has such astute notes and I don't want to let her down. I'm not a good enough writer to pull off the vision my editor has in mind. I was the one who supported writers for film by working story ideas and editing, but never the writer. I can't survive another failure...on and on the thoughts flowed. All my insecurities ran amok forcing me to face the dragon. Several years ago, when I took the one and only writing class through Adult Ed, my beloved teacher, Anne, told me to apply for a full scholarship to the Santa Barbara Writers Conference. I asked her to repeat what she'd just said. I was a rookie. For the next few weeks, Anne continued to ask, and I trusted her so I relented and applied. I won a full scholarship. I was surprised--Anne wasn't. It was no different when I applied to the prestigious Prague Summer Writing Program. I was in the middle of a difficult recovery from a 6th surgery, and I was seeking something to occupy my mind...something to dream about. It was also an exercise to gain experience in putting together a writing submission. When I received not only the acceptance, but a $1000 scholarship, I sobbed. It was the most exciting and stunning news I'd received in a very long time. Every talented writer (my co-students where 95% of them were younger than me) in the program possessed a B.A., M.A., PhD or even a Doctorate. Not me. It was both flattering and intimidating to be attending. One thing's for sure, it kept me on my toes! And I basked in the stimulating beauty of Prague while gaining a learning experience that will never leave me. But, I've never fully tasted success. Certainly not financially. Like I said, I get by by the seat of my pants. I rise to the occasion as best I can. 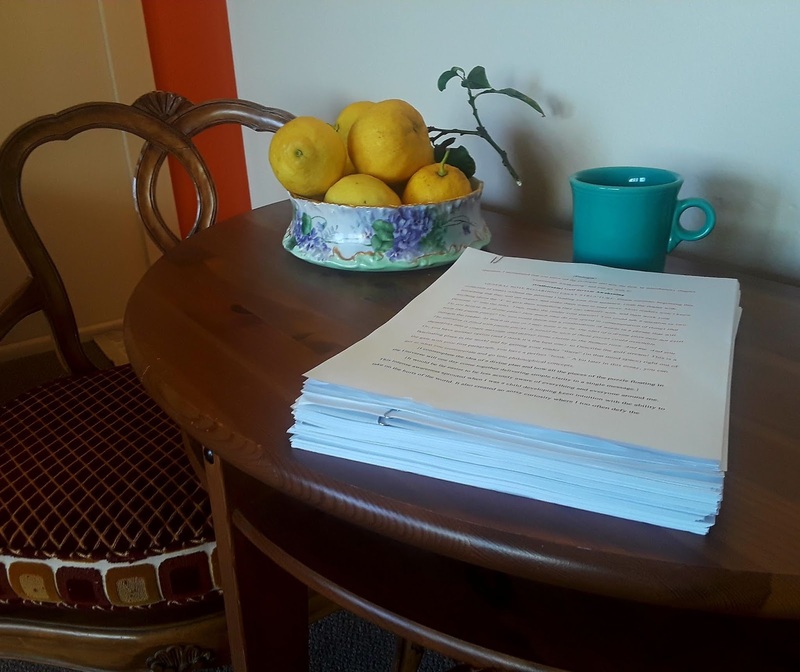 And, as the manuscript weighs down my little drop-leaf table, I must meet the challenge. I feel exhausted knowing the concentrated focus it will require to succeed. I vacillate from renewed faith to a feeling that the book is drifting out to sea while I remain isolated and frozen in contemplation of a lifetime of insecurities and setbacks. Personally, I find it fascinating that faith in myself is buoyed by a person I highly respect having immense faith in me. Why do many of us do this? Why do artists continually doubt themselves? I envy those who possess strong foundations and go boldly in the night. There's a part of me that believes that kind of brazen faith in oneself comes first, from a parent's unconditional love, support, and pride. Perhaps this is naive, but I have a nagging sense that it's the missing link for me. When I attended a reading recently, the director of the event asked if there was any news from the audience. I raised my hand to acknowledge the friend I'd shown up to support who was doing a reading from her book of short stories--A friend and co-student, I hadn't seen since our Prague writing program and great adventure. I quickly added: "And, I just finished a draft of my book". Everyone acknowledged my statement. It was an impressive reading by seasoned writers. Later, when I gave kudos to one of the writers who read poems, he said, "hey, congrats on completing your draft... that is a big accomplishment". Yes, I must give myself credit for getting this far. I've yet to celebrate a giant step toward the finish line, but I plan to. Maybe when I clink cocktail glasses with a friend for my accomplishment, I'll take a deep breath and muster the confidence and energy to take on the task at hand. The task and worthy adventure millions of writers have taken on before me. It was a pleasure to read about your journey. One thing that keeps me going is knowing I have a lot of company in the fear dept. I've read that even seasoned writers, every time they start a book, get the same feelings as you and I do. The fear is never ending, but for the most part, writers get better at handling the fear, intimidation, self-doubt, etc., know it as part of the process and push on in whatever way works for them. Sometimes I can only write a paragraph a day, sometimes just a first sentence. I also do yoga and sometimes all I can manage is to get on my mat in corpse pose, or child's pose, and maybe get quiet and have a cry. The thing is that like most writers, I would do the writing whether it was seen by others or not, because I'm incapable of not writing. Nothing, *nothing* gives me so much pleasure.